Greater Philadelphia Bicycle News: Columbia MO and its real "Amsterdam Project"
Columbia MO and its real "Amsterdam Project"
Columbia MO is one of four communities that was selected for the Non-Motorized Pilot project which was to give $25 Million Dollars to each community in the last transportation bill to build up a bicycle and pedestrian infrastructure. This was complemented with an aggressive safety and promotional campaign. 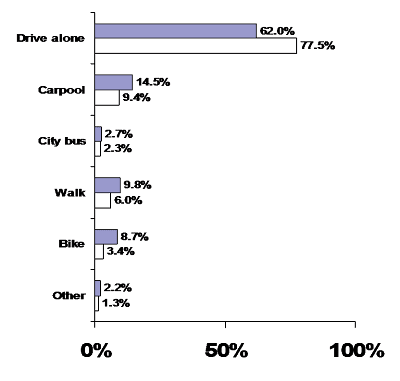 The preliminary results show very impressive gains in bicycle and pedestrian travel and a whopping 15% drop in driving alone. There is no telling how the next Transportation Bill will flush out, but the Rails to Trails Conservancy's 2010 Active Transportation Campaign seeks to greatly expand the pilot project include to 50 major cities and counties including the Camden GreenWay campaign. Come on - you don't think really, really high gas prices in 2008 had something to do with these numbers? Peter - Show me any location that has documented a 15% drop in Single Occupancy Vehicles-or an 8% by bike mode share. Camden County has been holding steady at 0.3% bike mode share and that is one of the better suburban counties.